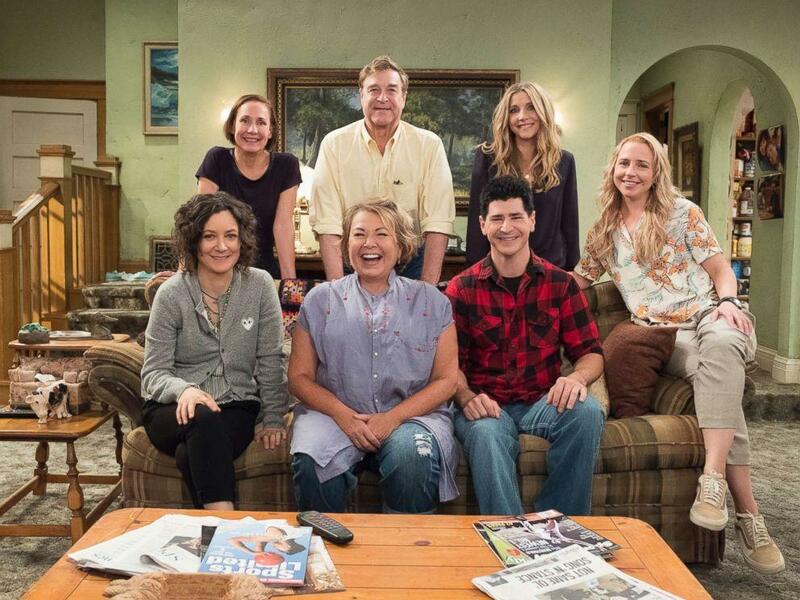 The "Roseanne" cast has reunited and a much anticipated reboot is scheduled to hit airwaves in March 2018, more than two decades after the popular sitcom signed off. But the reboot isn't only making headlines for reviving a beloved show; it's also making news and sparking controversy for its portrayal of contemporary politics and social issues. On the political front, the show's star and executive producer Roseanne Barr is an outspoken Trump supporter and her character on the show is set to reflect that, with her co-stars' characters split between support for the president and the opposition. "I've always attempted to portray a realistic portrait of the American people, working-class people -- and in fact it was working-class people who elected Trump -- so I felt that was very real and something that needed to be discussed," Barr told reporters at the Television Critics Association earlier this month. "This is a time where the country is very divided, and we did have a wonderful opportunity to talk about this in the context of a family." In 2018, it is probably realistic to portray American families as somewhat politically fractured. And while that choice may seem controversial to some, it is not nearly as controversial as the new reports that one of Roseanne's grandchildren in the reboot will be portrayed as a non-binary child. As detailed in the CBSN Originals documentary, "Gender: The Space Between," non-binary people do not identify with being either a man or a woman. Rather, these individuals often choose to reject gender completely, blend aspects of both or fluctuate between masculinity and femininity on a day-to-day basis. Some use different pronouns, preferring not to be referred to as either "he" or "she." The type of transgender person most often portrayed in the media -- someone who's transitioned from man to woman, or from woman to man -- is really just the tip of the iceberg. To reflect that reality, one of Darlene and David's two children is being cast as "gender creative." Casting calls for 9-year-old Mark, named after daughter Becky's late husband, called for actors who can play "sensitive and effeminate" and a child who "displays qualities of both young female and male traits." In the end, Ames McNamara was cast in the role. An early production photo of McNamara as Mark reveals that Darlene's child will show an affinity for dressing in feminine clothing. While the Showtime hit "Billions" made history as the first television program to feature a non-binary character, this "Roseanne" news is a big first for network television, as the reboot is set to air on ABC during primetime hours and thus attract a much wider, family audience. As one might expect, the news has been blowing up on social media, drawing particular ire from those who consider the inclusion of a non-binary character an affront to family values. Some cheered the character as a breakthrough, while others admonished, "Shame on you Roseanne!" The show has her grandson, who is 9, wear dresses. I will not support that. The show may throw out a few conservative lines. Or show some support to President Trump. But I will never support child abuse. Our boys are under enough attack. Some social media users even claim that featuring a character like Mark is a form of child exploitation. 'Enlightened' progressives (liberals) have always used sitcoms as vehicles to normalize their looney left agenda, but lately it's a race to see who can be the sickest and most exploitive, including exploiting children. Others, however, are cheering the move. The sitcom has never shied away from tackling controversial social issues. In 1994, it famously broke ground with the decision to air a lesbian kiss on network television, even after Barr claims ABC "threatened to cancel it and everything." After breaking boundaries in the 1990s, it makes sense that "Roseanne" plans to tackle issues of gender identity in its next iteration. It is, after all, a reality for many Americans, and the decision is already inspiring people to have a conversation about non-binary identity.